oncepts overnight best vesting and then talk a couple of case studies of Berkshire Hathaway Google and Facebook and then we’ll open it up for questions. So let me first just to reduce myself and tell you a little bit about case learning. So I I grew up all around the world. My parents met married to the Peace Corps and went to Harvard undergrad helped Wendy Kopp start Teach for America. The only job I’ve ever had in my 30 plus years since college I worked in Boston Consulting Group for a couple years. And then what Harvard Business School. Spent five years working with Michael Porter. After HP asked starting something called the Initiative for Competitive Inner City and then I hung out my shingle as the world’s smallest restaurant. On January 1st of 99 almost 20 years ago I did that for 83 more years until I closed it up last fall and launched case learning so that’s a quick quick introduction. I’m glad you got to come over here and introduce yourself. Hi. Good afternoon. Just before I introduce myself as far as the process is going with me described that you cannot ask questions if you goof around a little bit on the application I think you find where to find the chat and when you find the chat just put your questions in there and I’ll be doing my best to answer those questions. So I grew up in New Jersey West Orange New Jersey went to Princeton as an undergraduate studied electrical engineering computer science there got a an MBA at Wharton in finance and in marketing my dad started to come to Kolata or Dunlap’s which was an equipment manufacturer a television career. And I worked there for month from the time I was 10 years old. After he sold the company I went to work in investment banking was a magic director of DLJ Johnson Lufkin Jenrette. After 20 years at investment banking I became the president of DLJ Direct which was an online brokerage firm subsidiary of DLJ. We went public. I was president of that through the time that DLJ got sold to a Credit Suisse First Boston. I went over to work in banking at UBS for a couple more years while I was at DLJ Direct I got to know Whitney very well. We became friends. We became co-investors in many situations. And I had the investing bug and it wasn’t going away. And so I left my best banking to come high pitch fund manager corporate with Whitney for eight years on my own for a couple years after that. And Whitney and I got together about a year ago to start with this program that you’re going to see over the next couple hours. Thanks flen. So in short we’ve been doing this a long time both you know cumulatively between the two of us are running hedge funds and mutual funds for 30 years combined. I’ve been in the world of finance for 50 years combined. So we love we love the business love of the investing game and love to teach it. So so that’s what we’re doing now. And it’s fun being back together so I’m going to really quickly skim through just a couple a few slides describing case learning. I’ll send it around John PTF later and then we’ll dive right into what you came for the intro to value investing so. Last fall after I closed my funds I decided that I’d love to teach a lot to teach the next generation of investors so create a case learning Glen join me shortly thereafter. And the idea is we’re trying to teach both with this intro seminar as well as on the more advanced courses that we teach what we call lessons from the trenches. Investing is a hard hard business. And and what we’re trying to teach is this is everything that we’ve learned both things we did right as well as the things we did wrong over the years to to people who were were trying to learn. This is an experience based business and it’s very very difficult to get experience going around and making mistakes on your own. So we’re if you’re lucky enough to get a job at one of the big shops and someone trained that’s great but 99 percent investors aren’t that lucky. I wasn’t that lucky. 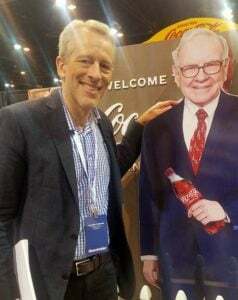 I learned the investing business entirely on my own and from sitting in on Joe Greenblatt’s classic to be going to 21 consecutive Berkshire meetings and so I have you know Glenn and I both recognize that there’s a real need out there for people who want to learn from somebody else’s experience rather than getting their own experience to our place.